An animated gif image grabbed the attention of many this week. 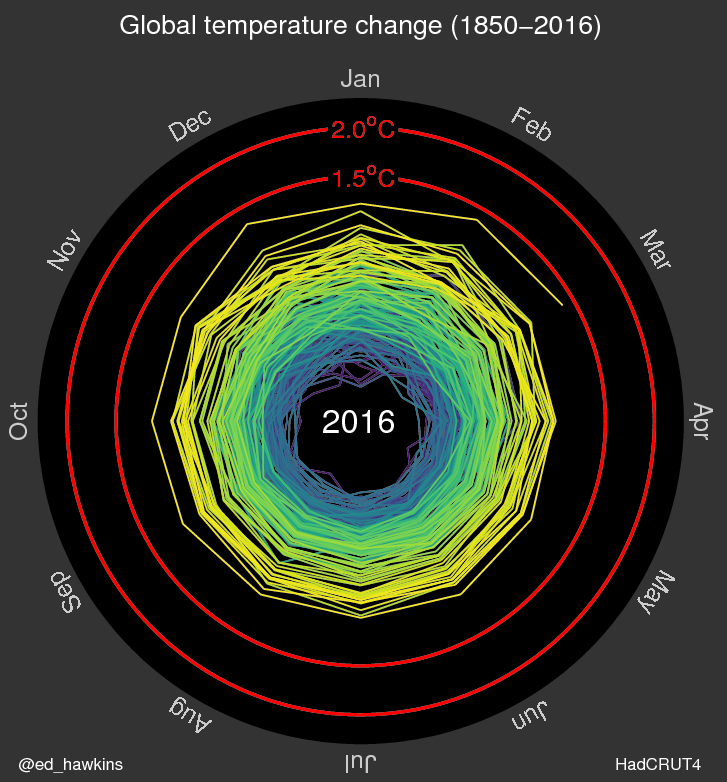 It is the monthly global temperature data from 1850 to March 2016 graphed as a spiral. A powerful image of the changes in temperature that we humans are causing. The animated image and a couple of associated graphs displaying the same data in different formats is by Ed Hawkins. He is a climate scientist in the National Centre for Atmospheric Science at the University of Reading, and also a Contributing Author for the IPCC 5th Assessment Report. The colours in the graph represent the change in time. Purple for early years, through blue, green to yellow for most recent years. The colour scale used is called ‘viridis’. Two other graphs highlighted the change in temperature as well released by Ed Hawkins on twitter on May 5. Note the leap in temperatures for 2016. Data for these graphs is sourced from HadCRUT4.4 from January 1850 – March 2016, relative to the mean of 1850-1900. 1850 was used as a starting point, as before then there was insufficient temperature data to reliably construct global average temperature. Ed Hawkins makes clear that temperatures are not ‘spiralling out of control’: that humans "are largely responsible for past warming so we have control over what happens next." He tweeted a big "Thank you everyone for sharing the spiral temperature GIF. The response has been incredible. What happens on future spirals is our choice." 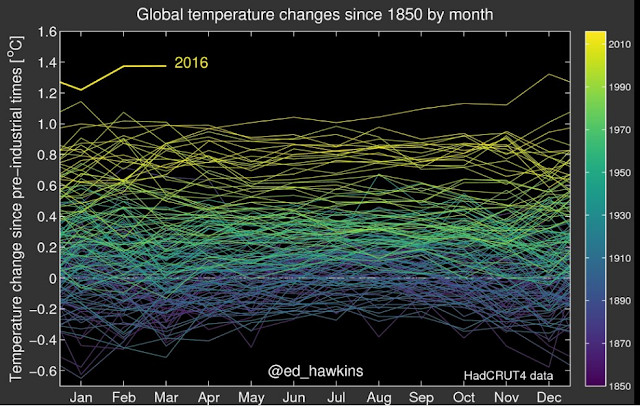 A more traditional graph of the rise in global temperatures based on HadCRUT4 data. Ed Hawkins has also used the same colour scale to plot the change in Arctic Sea Ice extent. Yes, 2016 is tracking as one of the lowest on record. And the latest adaptation is extending the spiral out to 2100 based on the Business as Usual RCP8.0 emissions scenario. It's going to get very hot. Too Darn hot.